22 March World Water Day— “Better water, better jobs”. On March 22, World Water Day, rural communities in Uganda’s Isingiro District celebrated the gift of water. Chronically short of safe and drinkable water, they value every drop. For HIV and AIDS orphans and their caregivers, their own rainwater tank is a life changer freeing up time for school and income earning. The Centre for Community Solidarity has set up village groups of caregivers to help each other make this major investment. CCS teaches them how to maintain the rainwater harvesting system, using a simple fired clay filter made by CCS out of local clay and sawdust, and coated with silver nitrate. In the kiln, the sawdust burns, leaving small holes to filter the water. A water tank saves a long trek to the river and means the families are cleaner and healthier. CCS offers health education and opportunities to improve family income by supporting various agricultural projects. In a country where only 15% have access to water on tap, this achievement is remarkable. You can read more in the Summer Story. Thanks to the many generous donations to the Fiji Appeal, CWS has sent $15,000 to partner Social Empowerment Education Programmme to deliver food, hygiene, building and other supplies to remote inland communities in Viti Levu and Vanua Levu, and to fishing communities on Vanua Levu. SEEP is exploring psychosocial support for families affected by the storm with winds up to 320 km per hour. More help is needed for the months ahead. Please support the Fiji Appeal if you can. A year ago Vanuatu was hit by category five storm, Cyclone Pam. It affected 188,000 people and destroyed 15,000 homes. Drought and water shortages have made life harder in the worst hit islands. 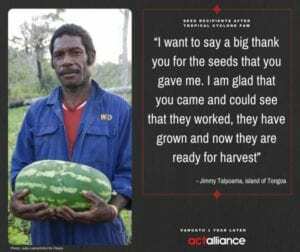 ACT Alliance is currently assessing the effectiveness of its first Pacific Appeal which helped with food, water and livelihoods. Special thanks to all those who gave to the Vanuatu Appeal. In South India the Human Rights Foundation is addressing the needs of poor communities through electoral processes. HRF focuses on the Panchayat and Gram Sabha (councils) by encouraging and training women, Tribal People and Dalits to seek election in this local government system. HRF also works at a national level to protect local democracy. Last year they organised two consultations for around 46 women Panchayat presidents and another with 60 Panchayat members on constitutional matters. They publish a bulletin three times a year and regularly advocate with state and national governments for the place of local government. In addition they are supporting women Panchayat presidents, for example one is trying to address water issues and illegal sand mining in her area. This work is supported by gifts to the Christmas Appeal. Five years of bitter fighting have left Syria broken and pushed 4.8 million people out of their homes and communities. Desperate to survive they have fled, facing an uncertain future. According to the UNHCR it is the biggest crisis of our time. The World Council of Churches (WCC) joined the call for humanitarian access into Syria. CWS partner, the Department of Service to Palestinian Refugees responds with comfort and practical help to those in Jordan and Lebanon. Please pray for peace and if you can, support the Syria Appeal. CWS was saddened to hear of the recent deaths of two community leaders. Subbu led the SAND Trust, a CWS partner working to improve livelihoods and human rights for some of the poorest South Indians. In his message on our 70th anniversary, Subbu wrote, “We honour the willingness of the New Zealander’s to support the poor in the world’ and in turn we honour his quiet leadership and total commitment to the people he served. Father Yohan Devananda played a key role in the founding of CWS partner Devasarana and many groups working for peace and interfaith understanding in Sri Lanka and Asia. We commend the children of St Matthew’s Church in Hastings, who raised $92 by selling chocolate chip biscuits. They chose to buy chickens for Palestine, water for Uganda, fishing gear for the Philippines and send a child to school in Haiti. Gifted is a great way to teach children about helping people overseas. We are looking for 100 people to join CWS’s fundraising challenge from 16-20 June to help Syrian refugees. Will you be one? Update provides news, information and stories. Reproduction of items is encouraged with attribution to CWS. Current and back issues are available.